When you walk in the door at Desert Financial, you are welcomed into a culture of positivity—a culture that continually creates real solutions for real situations. You will find a team that is made up of talented individuals; people that support each other and care about our community. 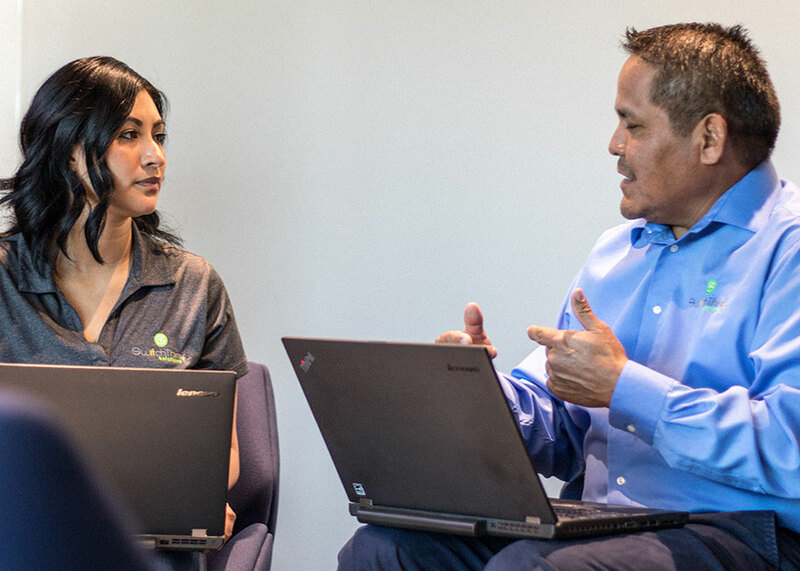 We invite you to step into a career where you’ll make a real impact. Find your place at Desert Financial. We aren't one to brag, but some news is just worth sharing. Our team is united by our passion to deliver awesome service - you know, the kind that just makes your day. We’re thrilled to have been recognized for our efforts, both in the workplace and in the communities we serve. In fact, Desert Financial was named one of Phoenix Business Journal’s Best Places to Work! At Desert Financial, we love where we live and the people who live here. So when it comes to helping our community, we like to get hands-on to really make a difference. Desert Financial has made lasting change in our communities by donating thousands of hours in 2018 through our paid volunteer program. And with over 1100 team members, we have a lot of hands to offer! A better you means a stronger us. That’s why our best investment is the one we make in our people. Our Total Rewards package helps keep you and your family healthy, helps you plan for retirement, and helps you enjoy your life. We strive to meet market pay standards in every department. The money you contribute is matched by Desert Financial. Funding your learning is just one of the ways we invest in our team members. Our benefits offer full coverage for you and your family. When you want to make a career move, we’ll support you every step of the way. We know that rest and relaxation is an important part of good work. We encourage community service through thousands of volunteer opportunities. For when you don’t need the time, but the money would be great. Whether you’re a dog or a cat person, we love our pets at Desert Financial. Get cash back for carpool karaoke. We reward you for your success! Don’t worry about losing your vacation time, it’ll still be there for you. We'll work with you to balance work/school responsibilities and you might even qualify for our new Student Loan Repayment Program! We have exclusive tickets to some of the best events in the Valley. Our team members come together several times during the year to donate blood and help save lives. Most donors find it a painless and heartwarming experience, especially around Valentine’s Day! Team members will be helping the Children’s Museum staff to replenish their largest interactive exhibit, a full wall of hand-painted corks! esert Financial volunteers help to sort, pack and arrange donated goods that will help homeless families and individuals in crisis. 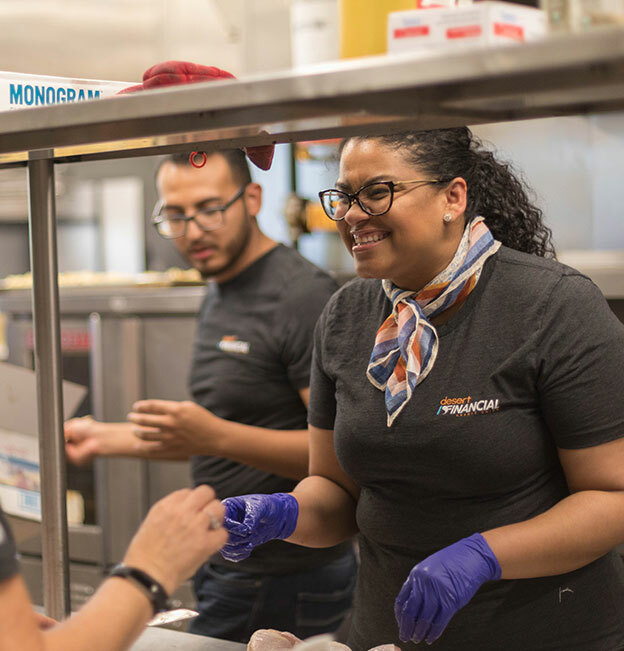 Volunteers will prepare and serve dinner to residents of the Transitional Living Program at HomeBase Youth Services, an Arizona-based nonprofit that addresses the growing needs of at-risk and homeless youth age 21 and younger. Desert Financial team members will be sorting food through St. Mary's Food Bank Alliance. Bags of Hope are backpacks that include individually portioned, shelf-stable meals and snacks that children can take home for the weekend. Desert Financial volunteers will race (and support the runners) for donations toward the Pat Tillman Foundation, which unites and empowers military veterans and spouses. By participating in the walk, Desert Financial employees can help the foundation increase awareness, education and research and improve the quality of life for Arizonans with kidney disease. At this event, team members will deliver nearly 1,000 backpacks with non-perishable healthy meals and snacks to Phoenix area schools. At this event, Desert Financial volunteers will help distribute food boxes to families in need around the Valley. Volunteers will help set up study tables, assist with crafts or educational projects, provide tutoring and homework help, and clean up after the event. Volunteers will be prepping and packaging scientifically formulated, nutritious meals for malnourished youth in developing countries. At this family-friendly event, volunteers will prepare and serve dinner to residents of the Transitional Living Program. Desert Financial volunteers will help to sort, pack and arrange donated goods for these families in crisis. Volunteers will pack care packages to be sent to deployed troops. Since March 2005, PFH has averaged 1,000 to 1,500 packages a month being shipped to our heroes. Our team members come together several times during the year to donate blood and help save lives. In Honor of September 11th's National Day of Service and Remembrance, Desert Financial will be partnering with Packages from Home for a special volunteer project at their facility in Glendale. Join us as we REMEMBER by packing and sending care packages to our troops overseas. Desert Financial volunteers will help to sort, pack and arrange donated goods for homeless families and individuals in crisis. Volunteers will pack care packages to be sent to deployed troops. Join us for our annual all-employee event, a conference with educational opportunities and workshops for team members at all levels of our organization. Learn more about our Mission, Vision and Values, and hear about where we’re going next from our leadership team! Desert Financial team members will be sorting food for prepared food boxes that will be distributed to local residents in need through St. Mary's Food Bank Alliance in Surprise, AZ. Our team members come together several times during the year to donate blood and help save lives; join us on Halloween and make the vampires happy! Volunteers will pack care packages made of food, personal care and recreational items to be sent to deployed troops. Volunteers will prepare and serve dinner to residents of the Transitional Living Program at HomeBase Youth Services, an Arizona-based nonprofit that teaches youth how to live healthy and independent lives. Our volunteers will offer a variety of mentoring activities to help children excel at school, learn new skills and build their self-esteem..
Just in time for the holidays, Desert Financial volunteers will pack care packages to be sent to deployed troops. Packages from Home (PFH) is a charitable organization whose sole purpose is to provide food, personal care, and recreational items to deployed American troops, at no cost to them. Search our open positions now!